Every once in a while I get a hankering for big, buttery, Chardonnay — i.e., “New World” style, usually from a warm-to-hot wine region. Although this wine comes from grapes picked both from Carneros and Napa Valley, to me, this wine speaks Napa. When I think of Napa Valley Chardonnay, I think of a rich golden color, toasty vanilla and super-ripe pear aromas, over-the-top sweet ripe fruit upfront, and a hefty, almost syrupy texture. Pine Ridge delivers on all these expectations. To be clear, this is a style of wine that I want to have occasionally — not all the time. It’s huge in the mouth, with globs of sweet bright fruit that is almost cloying, but somewhat tempered with ample acidity. This wine definitely got a good dose of American barrels, because in addition to the vanilla punch it has more tannin than most rose wines and a few light reds. Though it finishes dry thanks to the acid and tannin, this has plenty of sweet flavor upfront and through the midpalate, which means I recommend you pair it with spicy foods. I matched it successfully with BonChon fried chicken. On its own, I’m sure there is a crowd that will love this as a “cocktail wine,” though its acid and tannin structure beg for food. This wine has also been reviewed by Heidi of Brix Chicks, Bill’s Wine Wandering, and The Wine Spies. Generally speaking, Lodi, California is not known for Syrah (nor is Lodi, New Jersey). Rather, Lodi — a town and an AVA (American Viticultural Area) in San Joaquin Valley, within the Central Valley of California — is better-known for Zinfandel, thanks to many “old vines” bearing the grape. Some of these “old vines” were planted over a hundred years ago, and they, along with the soil and climate, combine to create Zinfandel-based wines that exude unique character not seen from the grape elsewhere in California. In fact, Lodi and Zinfandel have become almost synonymous. But this wine is Syrah, so what gives? On the one hand, I’m an “old schooler” in that I believe winegrowers should focus on grapes that have historically grown well in an area. Burgundy, for example, is focused almost entirely on Pinot Noir and Chardonnay — and the resulting wines are often mind-blowing, if not life-altering. In Champagne, it’s Pinot Noir, Chardonnay, Pinot Meunier — and nothing else. In Tuscany, it’s mostly Sangiovese. And so on. For California — and Lodi in particular — Zinfandel is indigenous and is at its best. Looking at characteristics in terroir, Lodi is somewhat similar to Costieres de Nimes in particular — an area in the Southern Rhone Valley that is well-known for Syrah. That said, I was excited to try this Syrah wine from Lodi. Perhaps my expectations were a little too high, because at first sniff I was disappointed. Don’t get me wrong — this is a very tasty wine. But it doesn’t remind me of Syrah from the Rhone. And that’s my problem, not yours. If you completely ignore all the geeky stuff about climate, terroir, soil, etc., above, and just drink this wine for what it is, you’ll probably be very pleased. It has an expressive nose of rich spices — cinnamon, cardamom, nutmeg, and vanilla — with a dose of black raspberry. In the mouth it explodes with sweet red and black raspberry (black raspberry brandy, actually), vanilla, and undertones of mild earth and blackberry. The texture is creamy. Tannins are mild to medium, as is the acidity. The finish is mostly vanilla and black raspberry. For me, the Syrah in this wine is overwhelmed by the oak component (it spent 15 months in French oak barrels), making it difficult to match with food. As a “cocktail wine,” though, it’s awesome, as it shows many layers of spice and sweet fruit. But understand, I’m overly sensitive to oak — most people like it more than I. If that’s your style, you’ll like Klinker Brick Farrah Syrah. 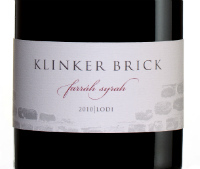 You can learn more about Klinker Brick Farrah Syrah by visiting the Klinker Brick website. Other blogs to have reviewed this wine include The Pour Fool, Winethropology, Cork Chronicles, Swami of Umami, Jane Garvey (2009 vintage), and James the Wine Guy. On first whiff the nose expresses enticing black and red berry fruits — both fresh and mature, but then as it sits in the glass it’s chocolate, chocolate, and more chocolate. In the mouth it is similarly dominated by a milk chocolate flavor mixed with blackberry and sweet black raspberry. It has a pleasant finish of more chocolate, vanilla, sweet red berry, black cherry, and boysenberry flavors that linger. There is ample, mouth-puckering acidity and mild tannins. Texture is smooth, with good weight, feeling almost syrupy. I’m not sure what to make of this wine. It’s clearly complex with enough acidity to match with food, but when I drank it with a juicy ribeye, all I got from the wine was chocolate. Sometimes I like the taste of chocolate, but not when I’m eating steak, so perhaps it should be more of an after-dinner wine with a cheese plate. Though the acidity was ample, the tannins were surprisingly mild. Despite all the ripe fruit upfront, there was no heat on the finish, which was nice. Also surprising was the sediment; generally I don’t expect that from a 4-year-old wine. Sediment doesn’t bother me and I don’t consider it a flaw, but I do find it curious. My thought is this wine was going through a “dumb phase” when I poured it — a time in its evolution when it wasn’t integrated, and showing less than its full potential. I say this because there is clearly a ton of fruit, complexity, and attractive aromas and flavors, but for whatever reason it isn’t hitting on all cylinders. If you have a bottle of this vintage, keep it in the cellar for at least another 6 months to a year before giving it a try. How long can it age? Hard to say, as the acidity will hold it together, but the lack of tannin — which with acid is also a preservative — suggests that this isn’t a wine for decade-holding. On the other hand, maybe I don’t understand what this wine is — which is possible (probable?) as I consider myself a novice when it comes to California wine. This wine was also reviewed by Drinkhacker, Bigger Than Your Head (2009 vintage), Pull that Cork, and The Wine Cask Blog, among others (if you’ve seen another review or written one yourself, let us know in the comments). Sauvignon Blanc means different things to different people. For some, it means grassy, herbal aromas. For others, it means tropical fruit character. And, there are people expecting musky aromas and strong mineral notes (i.e., Pouilly-Fume and Sancerre). For me, it means all of those things, and then some — what I’m expecting is for the grape to reflect its origin in some way. Estancia is one of my “safe” brands — meaning, it’s a widely available name that I trust to provide solid quality for value and at least a hint of “sense of place,” regardless of grape variety. Do I expect to have my socks knocked off? Not necessarily. Do I expect to get what I pay for, and maybe a little more? Yes. Did this wine meet that expectation? Yes. Clean, bright nose emitting lemon and lime citrus fruit and a distinct green element that most people associate with gooseberries — a strong, unripe, sour fruit odor that is typical of the Sauvignon Blanc grape. Some describe the smell as “cat pee,” and since I have yet to see/smell a gooseberry, but have known many cats, well … you can guess which description relates to me. It’s something you either appreciate or don’t like at all. Me, I appreciate that smell. In the mouth, Estancia Sauvignon Blanc is clean, fresh, and expressive, with ample acidity. Flavors are similar to the nose, but dominated by fresh lime upfront and finishing with lemon peel on the back end. It has a zingy character on its own, and is much more enjoyable with food. I enjoyed it with broiled flounder and scallops; it will be similarly well-matched with other white fish, sushi, mildly seasoned chicken and pork dishes, salads, and vegetarian cuisine. I picked this up for under ten bucks and for me, that’s a good deal. A good food wine. Usually I drink wine with food. I almost always eat food with wine. Sometimes, though, I like to have a glass of wine with nuttin’. In those cases, the “cocktail wines” are an ideal choice. And on this particular night, I wanted a “cocktail red” — something to sip on its own, that wouldn’t be too tannic, but have some richness and flavor. Oak wouldn’t be a major issue, because generally speaking, oak tastes good when food is not present. So I opened up this bottle, which was sent to me by a very nice PR person. Apothic Red is a blend of Syrah, Zinfandel, and Merlot. It helps to know that, but I really do believe I can taste all three varietals in the blend. The nose is a pleasant, inviting blend of vanilla, butterscotch, red berries, and black cherry — for me, the butterscotch is dominant in the aroma. Strange, I know — since when does a red wine smell like butterscotch? When it’s been whacked with American oak (barrel or chips? who knows? who cares?). In the mouth it has sweet flavors of ripe raspberry, chocolate, maraschino cherry, and boysenberry syrup (like what you get at IHOP). However, it finishes dry, with a balanced level of mild tannins and puckering acidity. It was exactly what I was seeking on this particular evening. I’m not sure I’d try to match it with food — I don’t know where I’d begin. Maybe General Tsao’s chicken or a similarly sweet dish from the Chinese take-out menu? It’s not sweet like a Yellow Tail or Hob Nob wine, but it’s not all that far from it, either — I would say it is a good stepping stone from critter reds to more “serious” ones, because it does finish relatively dry and it has nicely integrated tannins and acidity. Without question, a crowd pleaser — bring it to your next party where people will be drinking wine as though it were a cocktail.